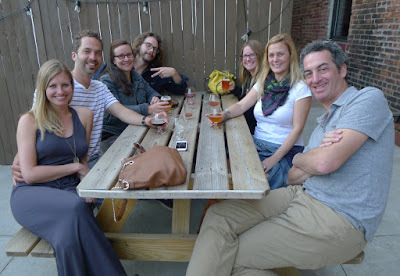 Our Cleveland crew at the Platform Beer Co. beer garden. So when my lady friend and partner in beer suggested we go to Cleveland over Memorial Day weekend, I thought, "Hot damn! We can go to Great Lakes and listen to 'Cleveland Rocks' in the car on the way there!" We did both of those things, of course, but oh so much more. And it was a blast. Turns out, Cleveland really does kinda rock. 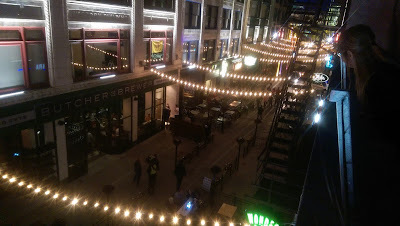 As a result of all this painstaking research, I'm pleased to present, in no particular order, a long-winded list of some things to check out for any connoisseurs of beer, food, and fun traveling in or through Cleveland. 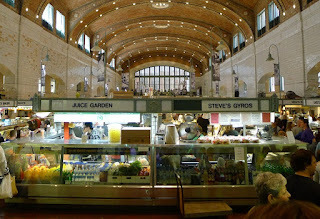 West Side Market. Like many of the things on this list, the West Side Market is located on West 25th Street in the formerly decrepit neighborhood of Ohio City. Unlike many of its neighboring businesses, it's always been there (well, at least since 1912), and it still serves as an anchor for its newly revitalized surroundings. Here you can get all manner of fresh produce, seafood, and meat, including the highly regarded and generously stacked Steve's Gyros (locals insist on calling them "JIE-rows"), which we sloppily ate in front of a bunch of vegans at an anti-GMO protest. (Yes, this happened.) Basically, it's Cleveland's version of Eastern Market. Market Garden Brewery, Nano Brew, and Bier Markt. Sam McNulty is pretty much the beer mayor of Ohio City. He owns all three of these West 25th Street establishments – two breweries and a beer-focused bar – and, thanks to local food and drink writer Doug Trattner, we got to pal around with him over some of his own brews. Bier Markt, a bar with 30+ drafts and even more bottled selections, is the oldest of McNulty's endeavors, opening in 2005. It offers guests a heavily Belgian-influenced menu of beers and food. 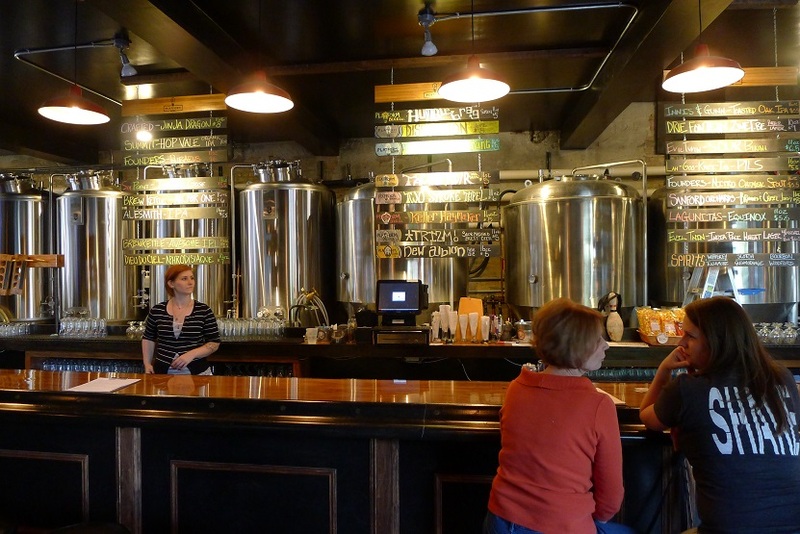 The Market Garden Brewery, located directly next to the West Side Market, opened in 2011 and has a large but inviting open-space design, including two huge bars, a sidewalk patio space, and an enclosed back beer garden. All kinds of beers were on tap, including a number brewed on-site. We enjoyed the #Kolsch, Boss Amber Lager, Progress Pilsner, and Citramax Double IPA, among others. 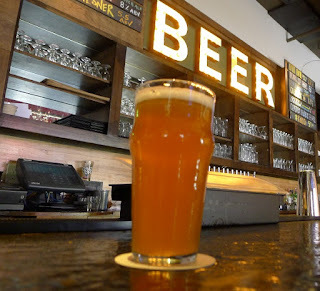 Finally, a few blocks down, the Nano Brew brewpub pours beers from Market Garden and other craft breweries on its 24 drafts, plus some more experimental ones brewed on the in-house one-barrel system, which serves more or less as a pilot system for Market Garden. McNulty's next endeavor is the Palace of Fermentation, a 23,000 sq. ft. production facility that will encompass scaled-up brewing aimed at regional distribution as well as fermented foods such as pickles, cured meats, and cheeses. Platform Beer Co. A short walk away, down Lorain Avenue, is Platform Beer Co., a microbrewery, tap room/beer garden, and "beer incubator" that offers a platform (get it?) 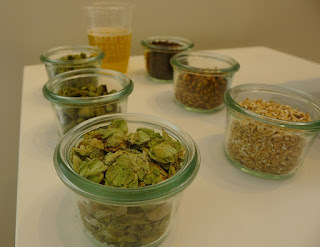 for homebrewers and others wishing to break into the business. They brew on a three-barrel pilot system and can even sell the results of their efforts in the tasting room, while the resident head brewer, Shaun Yasaki, makes unique creations on a 10-barrel system. The remainder of the 20+ taps feature well known breweries like Fat Head's, Ballast Point, and Lagunitas. 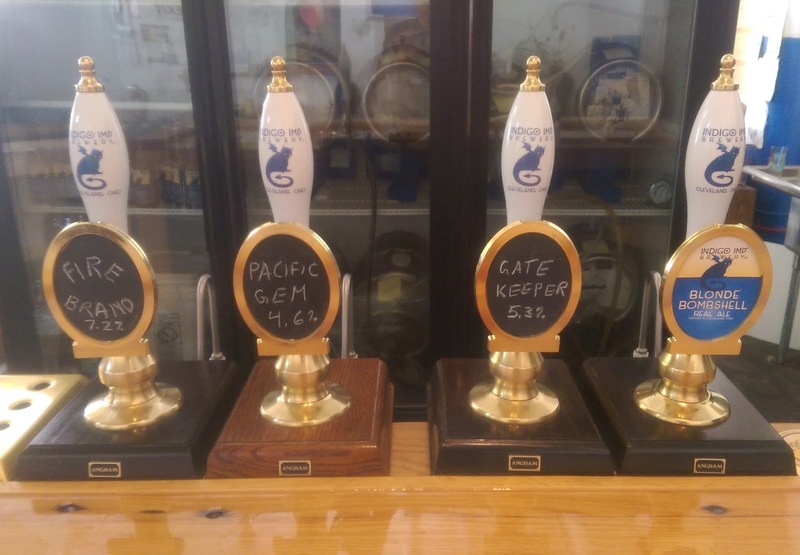 Especially intriguing were the Palesner, a pale ale/pilsner hybrid, and the New Albion Pale Ale, brewed in collaboration with Jack McAuliffe, the pioneering craft brewer. 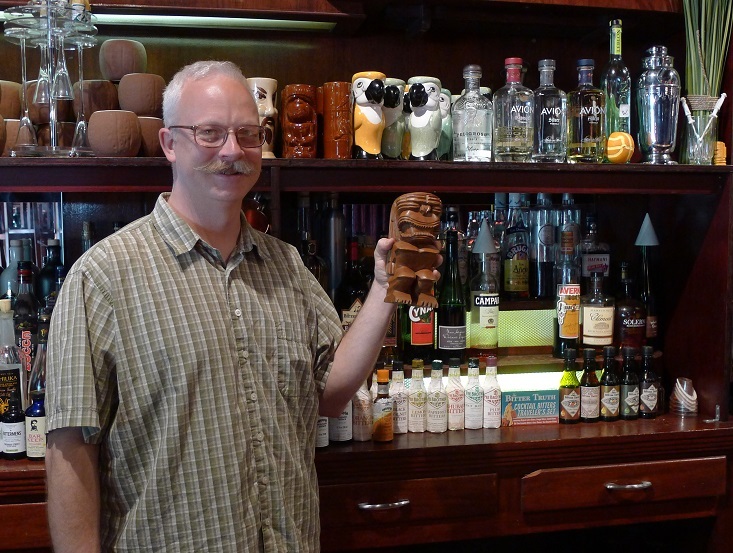 Porco owner Stefan Was with the mortal remains of "Tiki" Dave Jackman, who helped procure much of the bar's vintage decor. Porco Lounge & Tiki Room. Sometimes you just need to chill out at the tiki bar. I don't mean a patio half-assedly decked out in plastic Polynesian pap from the dollar store. I'm talking about the real deal, and the Porco Lounge & Tiki Room, across the Abbey Bridge, is it. Owner and tiki aficionado Stefan Was went to great lengths to refurbish a derelict former punk bar into a bamboo-and-thatch paradise for drinkers of exotic cocktails and lovers of retro kitsch. 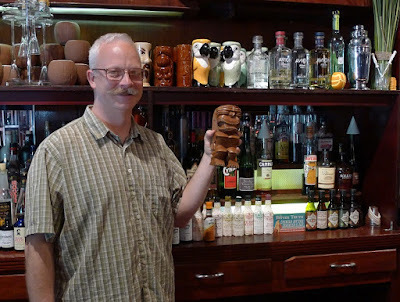 Everything from the 1950s swizzle stick-covered bar top to the shelves containing rows of glorious tiki mugs of all colors and shapes was designed by Was, who runs a manufacturing company as his day job. Much of the decor is authentically vintage, including artifacts from Cleveland's legendary Kon-Tiki, which closed its doors in 1976. The drinks? All your favorites including the Zombie and Mai-Tai, as well as coconut-heavy Painkiller and the aptly named Fogg Cutter (which exuded actual fog, thanks to "tiki magic," as explained by bar manager Shannon Smith.) All drinks are available in three "levels," and, as we found out, going up to Level 3 gets you "Porcoed" in a hurry. (Thank God for Uber!) If you go, ask to talk to Dave. He's always behind the bar. The Butcher and the Brewer on Downtown Cleveland's busy 4th Street. Tremont Tap House and Butcher and the Brewer. Although owned by the same folks, these two establishments sport very different vibes. The Tremont Tap House, located in the neighborhood that gives it its name, is a throwback to the quaint corner joint your dad might have hung out in once upon a time, except it has better food and a whole bunch more beers on tap – 48, to be precise. Good old fashioned barfly camaraderie lives there, too: a cowboy guy even shared his special bottle of high-gravity beer with us. The downtown Butcher and the Brewer's atmosphere could be described kindly as "upscale," less kindly as "pretentious," and downright rudely as "douchey." The beers we had were just all right, but the charcuterie was some of the best either of us ever had, and the cocktails, which blended things like gin with the beer, were surprisingly delicious. Plus it was fun to watch the meats being hand-cut. Worth a visit, but the earlier in the day the better. The beer engines at Indigo Imp. Indigo Imp Brewery. On the other end of the spectrum, Indigo Imp is as no-frills a place as you can get. It's got a few distinctive things going for it: First, the tap room – situated in a massive industrial campus that previously housed an elevator manufacturing company – is damn near impossible to find. It's also only open on Fridays for a few hours. And they make only cask and bottle-conditioned ales. (It was neat to see four beer engines arrayed in a row on the bar.) The beers included Blonde Bombshell Blonde Ale, Gatekeeper Porter, and Pacific Gem Pale Ale, but our favorite was Vetus Dark Lambic, a sour ale gravity-dispensed from the cask. The place is nothing special to see (it's like hanging out in someone's messy garage), but if you like a challenge and want to play bocce ball inside, by all means seek it out. The Great Lakes Beer Symposium. Great Lakes Brewing Co. 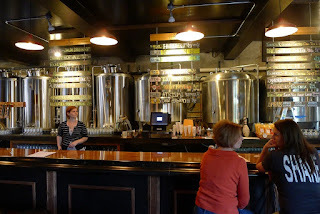 Yes, we made time to visit the venerable (in craft brewery terms) Great Lakes Brewing while in the neighborhood. I've been enjoying beers like Dortmunder Gold Lager and Edmund Fitzgerald Porter for years, and as luck would have it, the brewery just opened a new showcase room called the Beer Symposium, where we were able to arrange a tour of the production facility from Caroline MacDonell, who manages Great Lakes's public relations. She told us stories of how bad the neighborhood was back in 1988 when founder Patrick Conway had to sidestep a street fight to inspect the rundown old building he just purchased to turn into a brewery. We also discussed Great Lakes's many environmental initiatives as well as their new "brand refresh," the first re-design of their logo and artwork since the brewery's founding. Great Lakes continues to grow and expand, expecting to produce 175,000 barrels of beer this year, up 17% from 2014. In addition to the regular lineup, we really liked a couple pub-only brews, the Lawn Seat Kolsch and the Cleveliner Weisse, a Berliner weisse-style beer served with a touch of house-made raspberry syrup. Thanks to Doug, Sam, Stefan, and the many other new friends we made on this trip. As much as we did, we still managed to miss a few breweries and other hotspots, so hopefully we'll be back sometime in the future to take care of all that unfinished business.